History informs and shapes our approach to the present and the future. This is no different for major world events than for disciplines such as content marketing. For example, why do we feel so safe buying Michelin tires? As far back as 1900, the company released free travel guides to grow demand for cars in France. The Michelin Guide evolved to publish the restaurant star system that foodies obsess over to this day, giving the brand an association with quality that can only be achieved by such a strong commitment to offering helpful information to customers and prospects…. a.k.a. CONTENT! 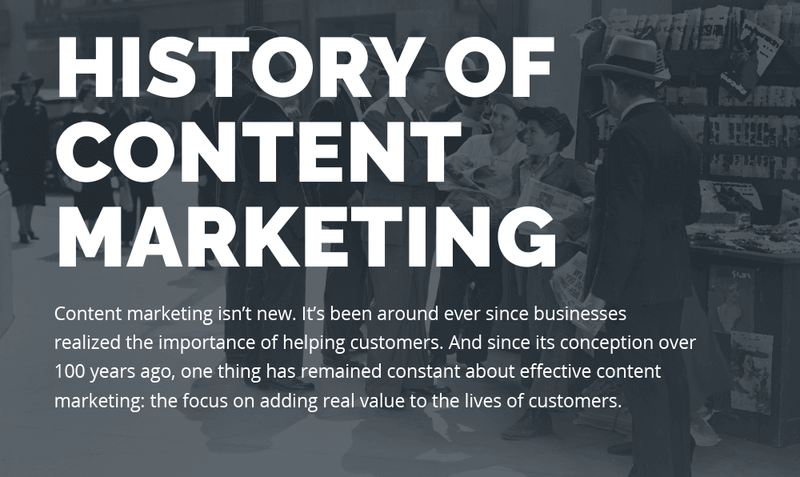 For the uninitiated the below infographic offers a helpful overview of where content marketing began, and how far we’ve come. We hope this offers a jumping off point to dive deeper into learning the history of content marketing. Great content marketing doesn’t need to reinvent the wheel (or tire), it just needs to have a very clear focus on adding real value to customer’s lives.